Adobe's stock is one of those stock that has given investors multi bagger returns. Since the lows in 2009, the stock has given investor more than 1000% return. Will this stock continue to perform and reward patient investors? I am really impressed with the nice uptrend that this stock has enjoyed. Whether it is in the daily chart, weekly chart or monthly chart, the stock is in a very very strong uptrend. Any dips was nothing more than a better place for investors to buy this stock cheaper before it started to rise again. The chart above shows the monthly chart of Adobe. The stock is still above its rising 20 MA and 50 MA in the monthly chart. Therefore, long term investors should continue to be bullish on this stock and not doubt this company. Since the moving averages are trending up, we should expect more bullish moves in this stock in the future. Any dips in the weekly charts and the daily charts are excellent buying opportunities for investors. They can also be a very good place for traders to find swing trades. 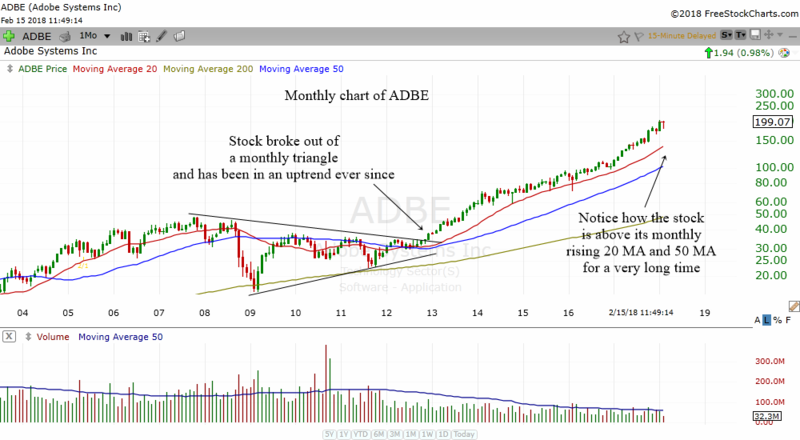 It is interesting to note that ADBE broke out of a monthly triangle and has been in an uptrend ever since. This is so amazing as chart patterns work even in the long term charts. The chart above shows the weekly chart of ADBE. 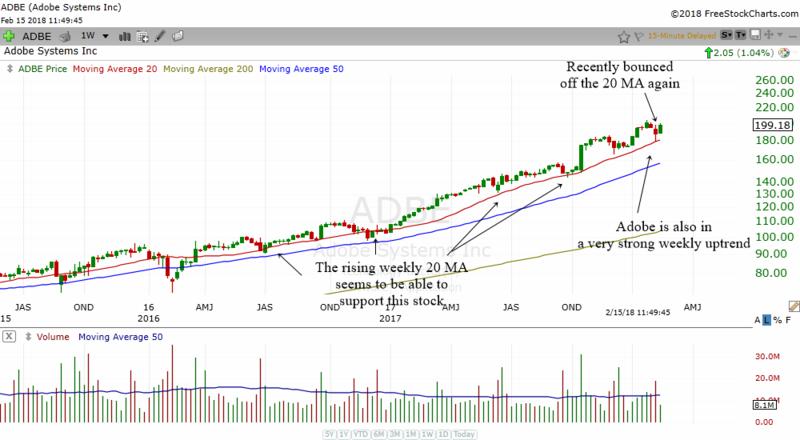 A simple trend following system like my favorite 20 MA and 50 MA was able to point to us that the trend is very strong in ADBE. The stock has been above the rising 20 MA and 50 MA most of the time and this is very bullish. Notice how ADBE has been able to find support numerous times when it touched the 20 MA. This provided nice trading opportunities and investing opportunities. The most recent drop to the 20 MA has also been able to rebound higher. 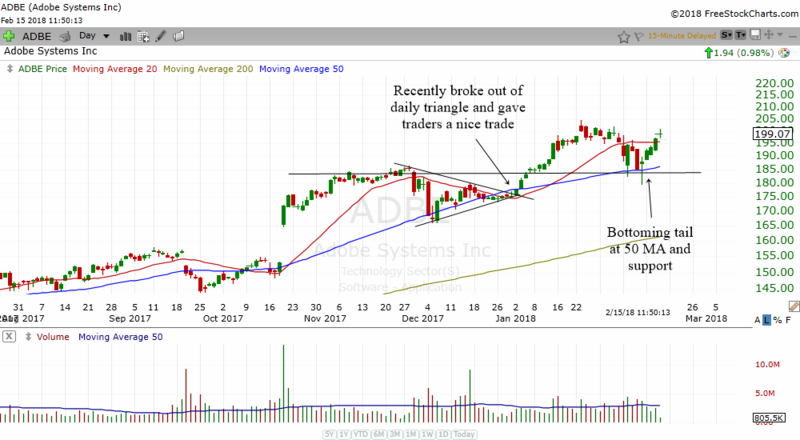 The chart above shows the daily chart of ADBE. This is the place where traders can often find many swing trading opportunities. Recently the stock broke above a triangle as it touched the 50 MA. This no doubt provided a nice money making trade for many traders. The stock corrected but was able to find support at the price support and the 50 MA. Which is why traders should always be ready to buy a stock when it falls to the 50 MA. The bottoming tail marked the end of the correction and at this moment the stock is still rising after the correction. Long term investors should take note of the rising 200 MA. As long as the stock is above this 200 MA, one should be bullish on this stock long term. Traders should continue to find dips and continuation patterns to play.